A teacher who secretly recorded himself sexually assaulting boys at the public school where he taught has been jailed. Phillip Evans, who taught music at King Edward's School in Edgbaston, installed spy cameras in changing rooms, Birmingham Crown Court heard. Evans, 38, of Warwards Lane, Selly Oak, was sentenced to three years and eight months for sexual assault, voyeurism and making indecent images of children. Evans admitted the charges at an earlier hearing. 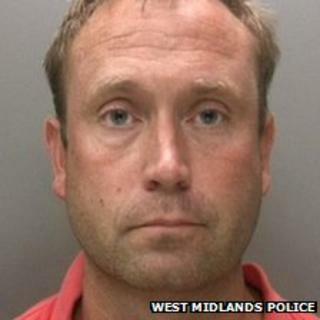 West Midlands Police said while the majority of the indecent images found on Evans's computer were downloaded from the internet, some had been taken at school. Detectives said Evans had bought tiny remote-controlled cameras and hidden them in changing rooms to record pupils as they got ready for sports. Evans, who also ran the school's RAF cadet scheme, installed a camera in a store cupboard where he would physically abuse boys while "measuring" them for their fatigues, West Midlands Police said. Det Ch Insp Chris Hanson said: "Evans, who has no previous convictions, had amassed 350,000 indecent images of children over four years and my team had the deeply disturbing job of analysing those sickening images in a bid to identify the boys who had been abused, where the crimes took place and when. "It is thanks to their determination, expertise and methodical approach that we were able to identify seven boys who had been assaulted by Evans at the school. "They and their families have been supported throughout this investigation."